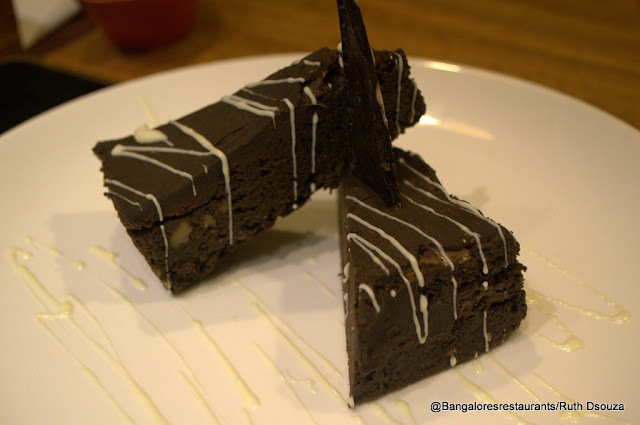 We have had Restaurant Week and Chef's Table Week and now we have new culinary extravaganza that makes a debut in Bangalore, from the same creators. Dinefest is a 10-day multi-city culinary event that will run from February 19th-28th. It opens up opportunities to explore 10 restaurants in the city through 3-course prix -fixe menus for lunch and dinner. 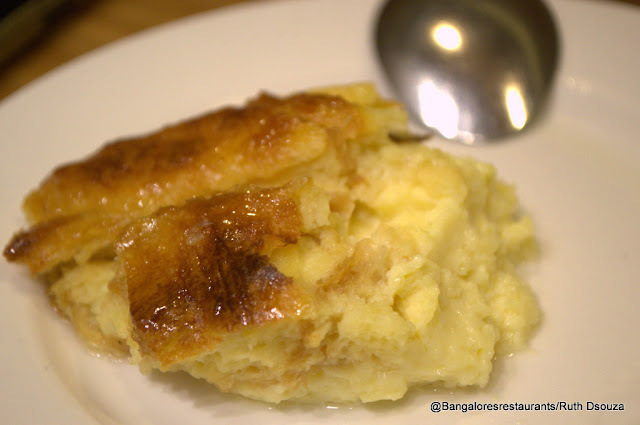 The event is on simultaneously in three cities and the price for the menu in Bangalore stands at Rs 500++ per person. 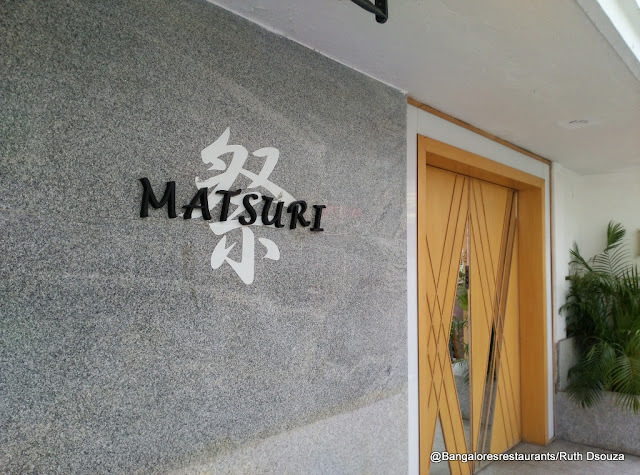 I was invited to a preview meal at one of the restaurants on the list - Matsuri. Having visited this Japanese restaurant at the Chancery Hotel on Lavelle Road earlier, I was glad to see that the menu gave me enough of choice to try something different from my first experience. Between the two of us, we were ample to sample two complete meals. We chose to go with Salad Maki - Thick Rolled Sushi with Assorted Vegetables (Above) and Ton Katsu - Deep Fried Pork Steak (Below) as starters. As soon as the platters were brought in we realized this was going to be a massive 3-course meal. 10 pieces to the Maki platter (this is for one person remember! 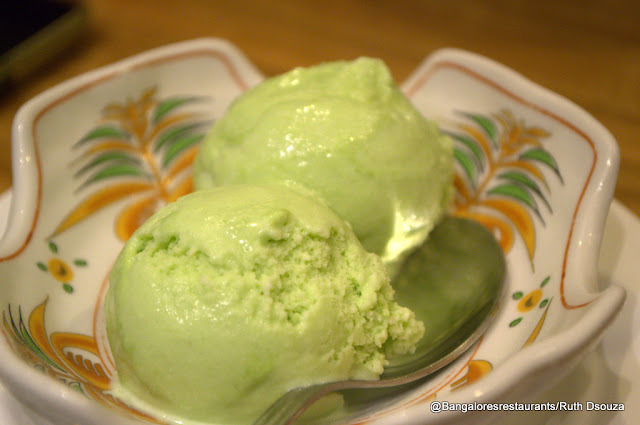 ), complete with the gari and the wasabi. The Ton Katsu too is a generous portion, good for sharing with a lovely dipping sauce. 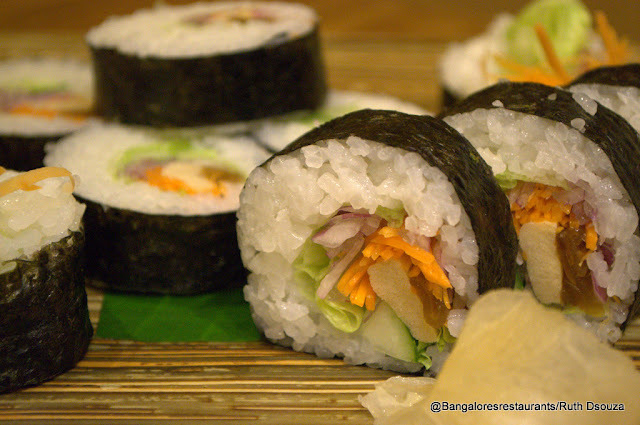 The Maki is rolled well, with a lovely crunch to the fresh veggies. 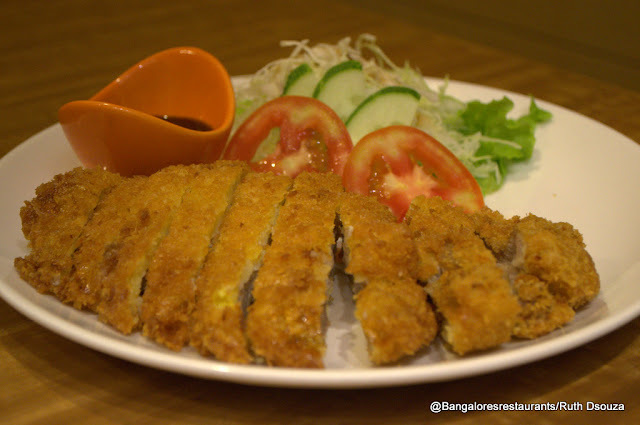 The pork steak is an absolute pleasure - a lovely crunchy coating with soft, very pliable meat on the inside. Coupled with the sauce, it makes for a great beginning. For the mains, we went with the Yasai Itame - Stir Fried Vegetables and the Saikoro Steak, which is diced beef with a Japanese Vinaigrette sauce. 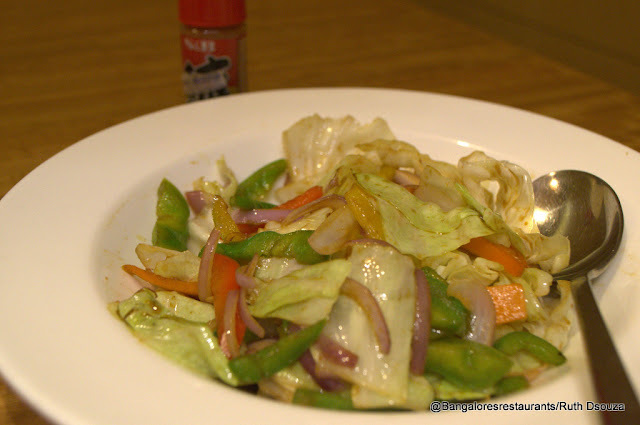 Though the Yasai Itame may not look like much, it packs a good deal of flavor with the lightly blanched vegetables. I could happily make of meal of just these veggies. 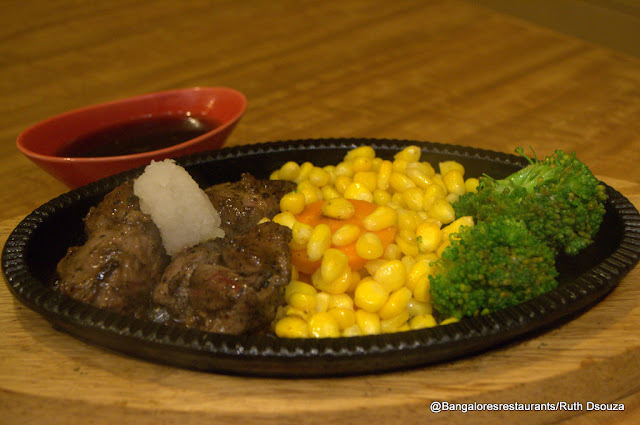 The beef medallions are served a sizzler platter along with fresh corn and broccoli and is topped off with shredded daikon. The meat is tender, yields easily to a knife and is seasoned just enough to bring out some great flavors of the marinade. 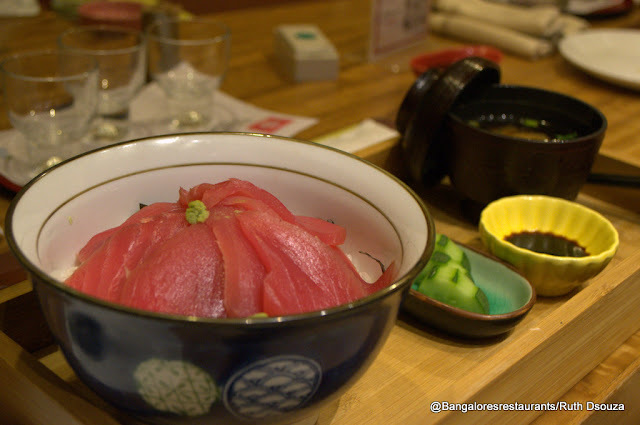 The main course segment is split into two, the second being the Starch choice - My next choice was undoubtedly the Tekka don - A sushi rice bowl topped off with sliced raw runa, served along with miso soup, soy sauce and pickled cucumbers. 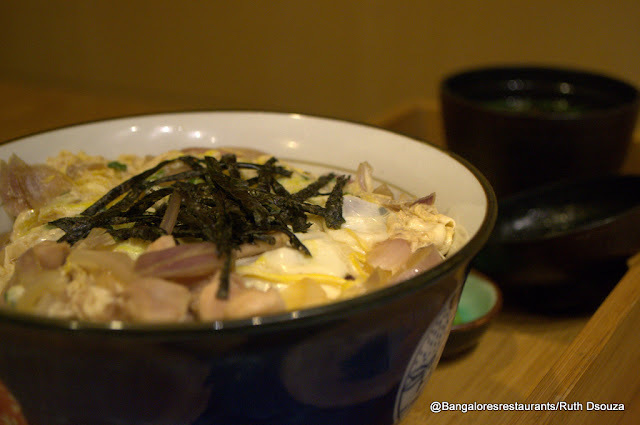 Sudhakar opted for the Oyako don - Rice topped with stewed chicken and egg drop, topped off with seaweed, served too, with miso soup and pickled cucumbers. I have to say I am in love with the Tekka don - the tuna was generous in portion, sliced perfectly and made for a simple, yet perfectly balanced meal with the sticky rice and miso soup. Sudhakar's bowl too packed in the flavors. Both bowls are quite deep and so the portion sizes are extremely good per person. Desserts offered several choices as well and we had the Egg Pudding, the chocolate brownie and the Wasabi ice cream. All of which made for good finishes to the meal. Though alcohol is NOT part of the meal offering in this Dinefest menu, you could definitely consider adding on to your meal. Matsuri has an exclusive license for Sake and Sochu and from the samplers we were offered, you wouldn't want to miss out on these. 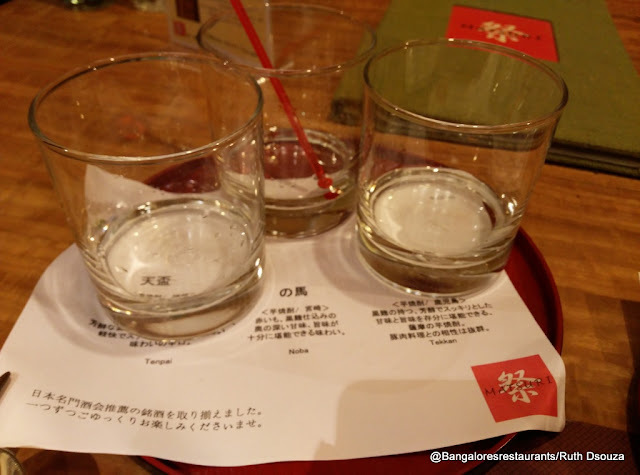 We sampled Sochu - Tenpai, Noba and Tekkan. My pick was the Noba. 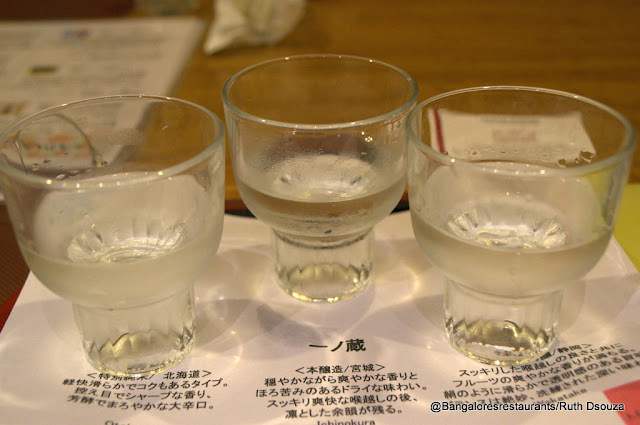 Among the Sake we tried the Otokoyama, the Chinokura and the Wakatake (L to R) . Here, my pick was the Wakatake. In case you are wondering about your children while visiting this restaurant, rest assured they will love the space and have something to choose from, from the a la carte menu. Anoushka has specific likes in every cuisine she tries and in Japanese, it is sticky rice with miso soup. That is what she had here. The Dinefest menu at Matsuri is an absolute steal for Rs 500++ per person. I cannot reiterate enough on how generous the portion sizes are. The service is extremely quick and efficient. Click on the Dinefest link to make reservations, for lunch or dinner, which are live now!